The BEST from scratch Three Ingredient Sausage Gravy. This easy breakfast recipe is a family favorite. Packed with flavor and only three ingredients; sausage, flour, milk! 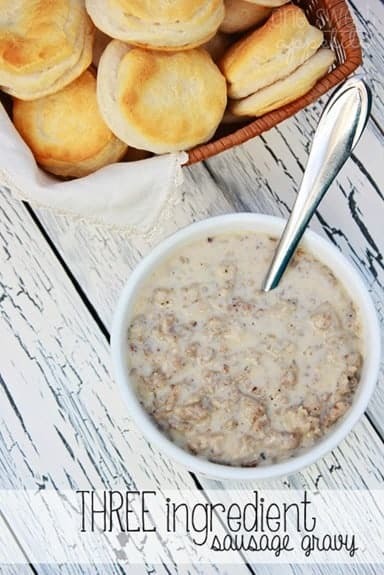 It is the best from scratch sausage gravy recipe! This easy breakfast recipe is a staple in our home. It is packed with flavor and super simple to make! 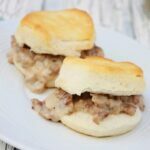 Pair it with my easy homemade biscuits, top with an egg, and you have a savory meal fit for a king! I do have to say, I was pretty impressed that you could get such a rich strong flavor with only three ingredients. The flavors meld together so well while cooking and a little dash of pepper knocks up the spice level. So are you ready for me to change your breakfast world? 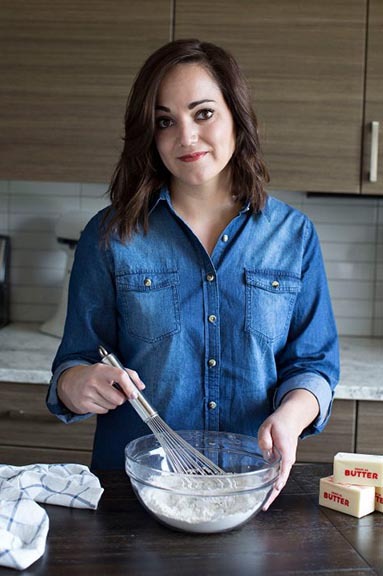 How do you make sausage gravy from scratch? The key to a good from scratch sausage gravy is having the perfect fat and flour ratio. With this recipe you start by cooking breakfast sausage in a large pan. Once it has browned you DO NOT drain. You whisk the flour right in until it is fully incorporated. Stir in some vitamin D milk, dash with pepper, and serve. Some of my readers have added a few tablespoons of butter to the sausage before stirring in the flour, but I have never found the need. If you are using quality ingredients you should have enough fat and flavor to make this dish a star. Can you believe how ridiculously easy that was? Bust open your warm biscuits, top with your gravy, and enjoy. The only complaint I have gotten over this recipe is that there are never any leftovers! 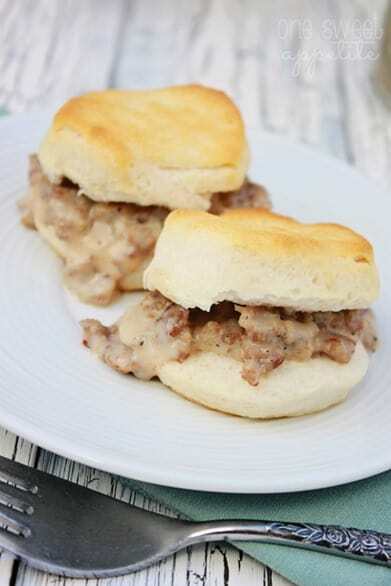 Can you make sausage gravy ahead of time? Technically, yes. We have made this gravy the day before and it has worked fine as a reheated option. Make sure you reheat it slowly in a pot vs the microwave. Can you freeze from scratch sausage gravy? Yes, however this recipe tastes much better when made fresh. After frozen you loose a little bit of flavor and texture. Like this recipe? You will love my Easy Homemade Biscuits, Breakfast Burritos, and Sweet Potato Breakfast Hash! If you have a large family I really recommend doubling. Three Ingredient Sausage Gravy. This easy breakfast recipe is a family favorite. Packed with flavor and only three ingredients; sausage, flour, milk! Brown the sausage in a large pan until cooked and crumbled. Stir the flour directly into the meat until it's fully combined. Whisk in the milk and simmer just until thickened. Sprinkle with pepper and serve over biscuits. This looks and sounds so good – I will for sure be trying out this recipe. So easy and so delicious! Taking this one on the husband’s and my campout! I wonder if there is a biscuit recipe that I can make and freeze ahead? I’d love to know if you have one! Thanks and happy day! Sh*t on Shingles. Gma always said it was a military thing. Any way… its amazing! My family calls this S.O.S. as well but the “shingles” can be either bread or fried potatoes. Yumm!! Now I am going to have to make it. 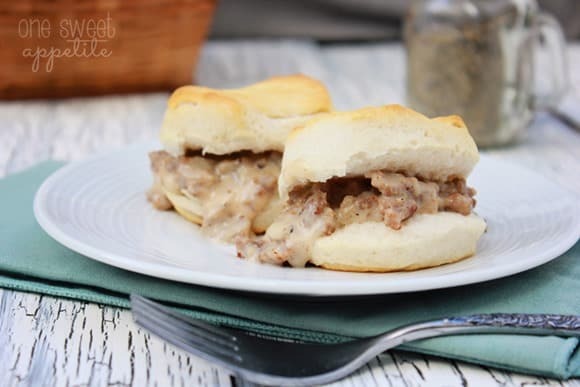 I have always made my sausage gravy this way and it’s awesome. This is how I always make my sausage gravy. And to me, it’s awesome!! And my boyfriend loves it too!! In fact, I just made some for New Year’s morning breakfast :). The s.o.s some of you are referring too is usually made with hamburger over toast or I also use the Buddig beef, dice it up, saute it in butter, then use the flour and milk for gravy, put it over toast. Both Yummo!!! Do u drain the sausage grease?? No. The grease helps mix in the flour. How would I make the biscuits on a camping trip? Going on my first one in a few weeks–eek! I would try to make them before you go or use a foil container and make them over the fire. Just keep a close eye to make sure they don’t burn.